Since 1985, Texas Winds has brought music and friendship to thousands of local residents who would otherwise be left out of the cultural riches of our great city. Many elderly citizens face difficult circumstances, with limited opportunities to enjoy the happiness of interaction with persons from the wider community. 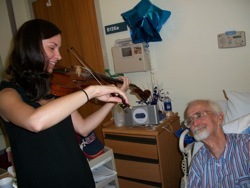 While our musicians provide first-rate entertainment, their greater aim is to strengthen morale, alleviate loneliness and improve quality of life for their audiences by sharing love, affirming seniors' dignity and allowing them to feel valued, not forgotten. 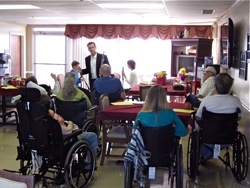 Texas Winds provides programs in 300 North Texas nursing homes, assisted living facilities, senior centers, adult daycare, facilities for the disabled, low-income senior housing, and retirement homes. Click here to listen to excerpts of our Concerts for Seniors. Hospital patients often suffer from fear, loneliness, alienation and insecurities in addition to illness. Texas Winds musicians provide a caring environment, improving the morale and well being of patients, family members, doctors, nurses and hospital staff. Programs are given in Dallas County hospitals, the Dallas Veterans Hospital and Fort Worth VA Outpatient Clinic. Areas served include rehabilitation therapy, oncology, bone marrow transplant, skilled nursing, transitional care, long-term care, lobbies, cafeterias and waiting rooms. and day treatment. Individuals confined to their home, nursing home room, or hospital room have limited access to Texas Winds' services. Concerts for Hospice are designed to comfort these individuals by sharing love and compassion through the nourishment of music. These one-on-one programs are offered in nursing homes, hospitals, residential care homes and can be arranged in private homes. Many children encounter great difficulties in pursuing an education because of poverty, crime and/or lack of family support. 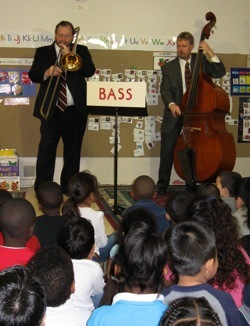 Texas Winds believes music teaches discipline, problem solving, working with others, and self-expression. As a partner with Head Start, we have a unique opportunity to contribute to the early learning environment of preschool children by stimulating their imaginations, intellectual curiosities and self-esteem. Texas Winds presents "MEET THE INSTRUMENTS" programs in 33 Dallas County Head Start, Mi Escuelita and Child Care Centers and 23 Tarrant County Childcare Associates Centers.